The people of the prior worlds reached for the stars. They engineered our world and others, opened doorways to other dimensions, and rewrote the laws of time and space. The remnants of these efforts litter the Ninth World,but they aren't limited to Earth. 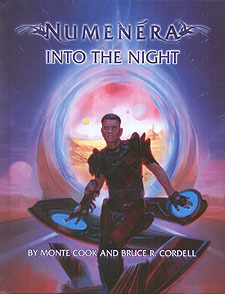 Through the magic of Numenera left behind by the ancients, the stars can be plied. Craft sail the void as if it were an endless sea, intricately designed doorways open onto distant worlds, and even stranger means of travel beckon those who are bold enough to cross the vastness of the night. Like the Ninth World, the realms beyond Earth are mysterious, majestic, terrifying, and filled with the unknown. Will you join the midnight pilgrims and discover what lies beyond Earth's shores? Dozens of locations on the moon, elsewhere in our solar system, and beyond - all as weird and imaginative as you'd expect from the Ninth World's setting. Visit Branu's Kiss, the Thon Iridescence, the wreck of the Verryn, the cloud cities of Urvanas, and the Swarmstar, perhaps the strangest sight in the void. Multiple ways to escape Earth's embrace. Climb the Beanstalk, explore the Nightcraft, or step through the World Door. New horizons of the imagination to fill your players with wonder and take your Numenera campaign to realms you've never before imagined!